Offer may - Malcesine "Garda in coro"
In Malcesine, few miles from our residence, from Thursday 23 to Sunday 26 May, will host the 7th edition of the national competition for white voice choirs “Il Garda in Coro”. During this contest, may participate white voice choirs with repertoire of both secular and sacred music. In addition there will be a new junior’s 2013 special category. During the days of competition the surrounding areas host individual and group concerts. For this occasion, the Residence Lake Garda provides a limited offer for studios and apartments (eg family with 2 children from 150 € per night). 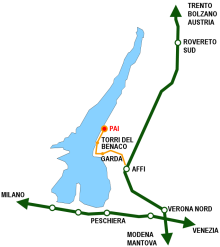 Other than Malcesine, you can also visit the rest of Lake Garda and the amusement parks of Gardaland and Movieland. For quotes and availability info we suggest you send an inquiry or call +390458220015 in office hours.